Your Kindness is NOT a Permission Slip. How to Set Boundaries. People don’t always understand what they’re asking of you. When they want a little something extra, they’re not thinking about what this little extra will cost you. They’re not considering what their thinly veiled demand will mean to your sanctuary. They’re trying to to get under the rope because they believe it matters. When we’re upset, we get a little messy. And we handle things badly. We all forget about common courtesies from time to time. You can’t let people run you over. 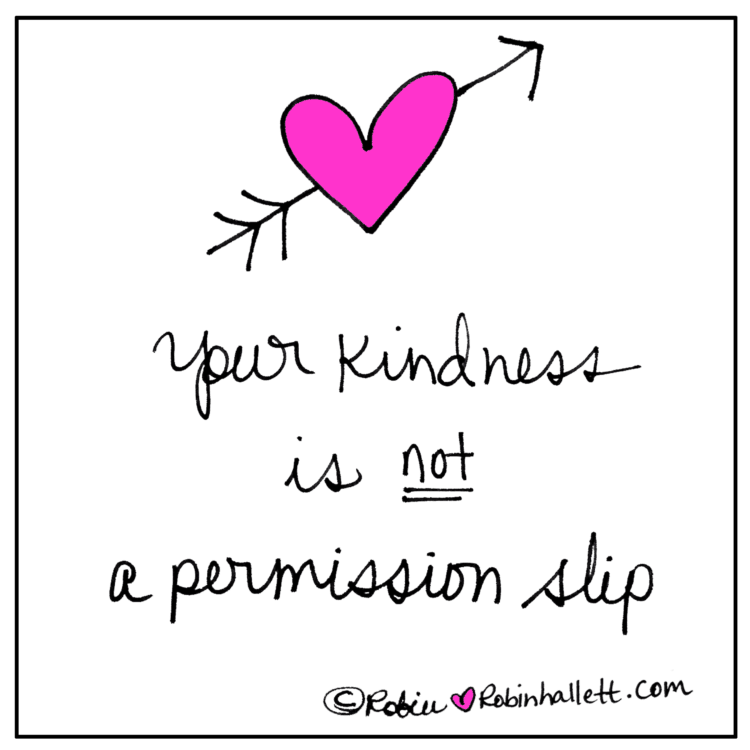 Your kindness is not a permission slip. Stop trying to explain it to them. It’s not their job to understand, it’s yours. So hold the line. And know in your heart what’s right for you. Yes, you will have to learn to deal with their disappointment and then bear the sadness of your own guilt. And it’s really hard sometimes, isn’t it? Because…I’m sorry to say it, but people can be such dicks. People will get mad at you. Maybe because they feel like their world is imploding, they also believe it will matter to you just as much. They behave badly or ask for too much because they’re upset. This makes them feel they can go outside the lines, under the rope. Because they are hurting. Because they need help. Because they know you are kind. Because you probably won’t say no. Even if they know it’s wrong. Ugh, I have done it too. Maybe you have as well? It doesn’t mean it’s right. It means we are all human. They may never see what they’re doing, but you do. You get it. And sometimes that has to be enough–even though it hurts, even though it’s terribly unfair. I’d rather you learn to be with these growing pains than continue to give what is not theirs to have. You are not here to bend over backward at the expense of your own peace. Don’t confuse empathy with being run over. Sometimes the kindest help is the answer of a no. Boundaries bring gifts to everyone on the path. Your kindness is not a permission slip. The yes never comes as cheaply as the no. You are the only one who needs to get this. And I know how hard it is but you can do this. Because the point was never about you keeping the world happy, the point was always about knowing yourself.